An evening retreat that stimulates ALL the senses – a sophisticated, interactive dining experience…. For only 60 x lucky guests – with cocktails and canapés being served for further guests who wish to enjoy and observe…. With Silver Odessey from London – bringing colour lighting therapy and sound scapes by Richard Norris of the Time & Space Machine to raise your vibrations and leave you feeling – amazing…. naturally. With Maureen Ji and Ilona Pantel-Ayaal there to guide you through sound healing, yoga, dance, visualizations combined with a solid detox. Detox has many wellness benefits including weight-loss, increased positivity, greater mental clarity, focus and calm for the mind. Your circulation and metabolism are also given a natural rejuvenation, with the extra oxygen flow encouraging your cells to renew, your complexion to improve, your tissues to be nourished and your whole sense of “being” feeling lighter and more alive. The re-balancing effects relax both the body and mind, boost the immune system and enhance your body’s ability to self- heal. All whilst you enjoy a greater sense of body-mind awareness too, so that you can return to reality ready and able to listen to the signals of what is (and isn’t) good for your body to do. Cleanse, purify and detox! 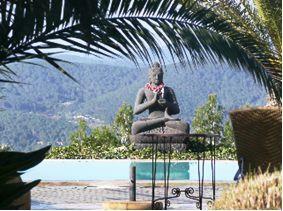 Buddha House (www.buddha-house-ibiza.com) is a luxurious country retreat situated high In the hills in the north of Ibiza with stunning panoramic views of the island. You will sleep in wonderful luxury rooms or have your own wooden house. Ilona Pantel is your detox facilitator, whose skills and qualifications spanpsychology, hypnotherapy, doctoral approved fasting guide and nutritionamongst many to offer a fully integrated approach to your detox retreat. Her expansive knowledge and life experience, training and working around the world, provides the optimum support for you to completely immerse yourself in the program and achieve the benefits that matter to you such as releasing psychosomatic blockages, restricting core beliefs and emotional patterns. Weaving her musical expertise and the modality of Sound Healing, Maureen Ji facilitates workshops, retreats and performances all over the world. Maureen Ji creates a safe space for opening with song, chanting, meditation, healing sounds and visualizations to bring about transformative experiences. In 2007 she received a diploma in sound therapy with the International Association of Sound Therapy and has since studied with a variety of sound therapists and body workers. Sound will take you to your deeper unconscious levels and open your heart! This retreat is for everyone with an open heart, a love of music, good food, dance and yoga who wants to detox and cleanse their body. • Yoga, chanting, dance and music! Purify and detoxify with holistic fasting retreats to feel lighter and brighter in body and mind whilst retreating up amongst the tree-tops, high in the mountains near San Juan. Held In the cosy-comfort and relaxing surroundings with breathtaking views and plenty of oxygen, even the air that you breath helps to purify your body and mind. Ilona Pantel is your fasting facilitator, whose skills and qualifications span psychology, hypnotherapy, doctoral approved fasting guide and nutrition amongst many to offer a fully integrated approach to your fasting retreat. Her expansive knowledge and life experience, training and working around the world, provides the optimum support for you to completely immerse yourself in the program and achieve benefits that matter to you. Ilona leads Dr O Buchinger’s fasts which are renowned for being the ultimate Fasting week for healthy people – guaranteeing healthy protein levels to be maintained whilst offering the body the opportunity to clear and cleanse and the mind the time to declutter too. The Dr O Buchinger Fast is a tea-juice-broth-fast. The body is supplied with watered down, ecologically produced fruit juices and vegetable broths, vitamins and mineral nutrients. 2 – 3 litres of mineral water are drunk per day. Daily yoga sessions, meditation, mountain walks, thai-yoga massages, reflexology, talks, relaxation (around the pool and in your private room) as well as guided Visualisations meant that these fasts become so much more than eliminations of food – they become thoroughly rejuvenating, for body, mind and soul. The programs are expertly designed to ensure that your body can release as many toxins as possible in the safest and most beneficial ways. The guided walks and daily yoga sessions speed up the elimination of waste materials from the digestive system and other internal organs and to flush your cells with oxygen to boost your body’s self-healing abilities. The yoga breathing techniques are based on purification principles proven over thousands of years – and are great stress-detoxers to take back to reality too! Daily Thai-yoga-massage and reflexology improve blood circulation and stimulate the meridians – or energy pathways – encouraging the body to clear physical and emotional blockages which offer deeper toxin release. Benefits include weight-loss, increased positivity, greater mental clarity, focus and calm for the mind. Your circulation and metabolism are also given a natural rejuvenation, with the extra oxygen flow encouraging your cells to renew, your complexion to improve, your tissues to be nourished and your whole sense of “being” feeling lighter and more alive. The re-balancing effects relax both the body and mind, boost the immune system and enhance your body’s ability to self-heal. All whilst you enjoy a greater sense of body-mind awareness too, so that you can return to reality ready and able to listen to the signals of what is (and isn’t) good for your body to do.